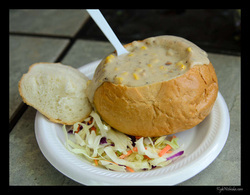 I know that corn is the most industrialized food on the planet but I really enjoy corn chowder about once a year. Start by sauteing onion, celery, potatoes in butter or ghee for about 5 minutes. Add water or veggie stock to cover 2-4 inches. Cook until potatoes are tender. Add corn and spices cook bring to a boil and remove heat. Garnish with cilantro.